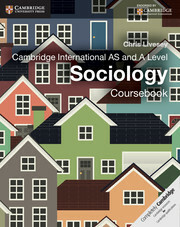 Written by a highly experienced author, Cambridge International AS and A Level Sociology: Coursebook provides comprehensive support for the syllabus.Accessible language combined with the clear, visually-engaging layout makes this an ideal resource for the course. Discussion of significant sociological research, case studies, explanation of key terms and questions within the text reinforce knowledge. Stimulating activities build interpretation and application as well as analytical and evaluation skills. 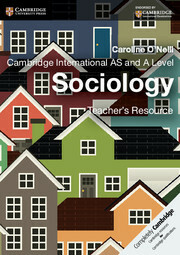 Revision checklists help in consolidating understanding.Cambridge International AS and A Level Sociology: Coursebook provides complete exam support with each chapter culminating in exam-style questions and a further chapter dedicated to revision, and examination skills and practice. A Teacher's CD-ROM is also available. Activities build key skills required by the assessment objectives - interpretation, application, analysis and evaluation.